I’m a bit of a matcha addict lately. Not just as a tea (once a day at least), but I also love combing it with sweet flavours. Like cakes and ice cream. It adds the subtle bitterness of the finest green tea and a lovely, bright green shade. I already tried it with cream cheese chiminangas (find my recipe here: Cream Cheese Chimichangas With Matcha And Strawberries) and it worked very well. 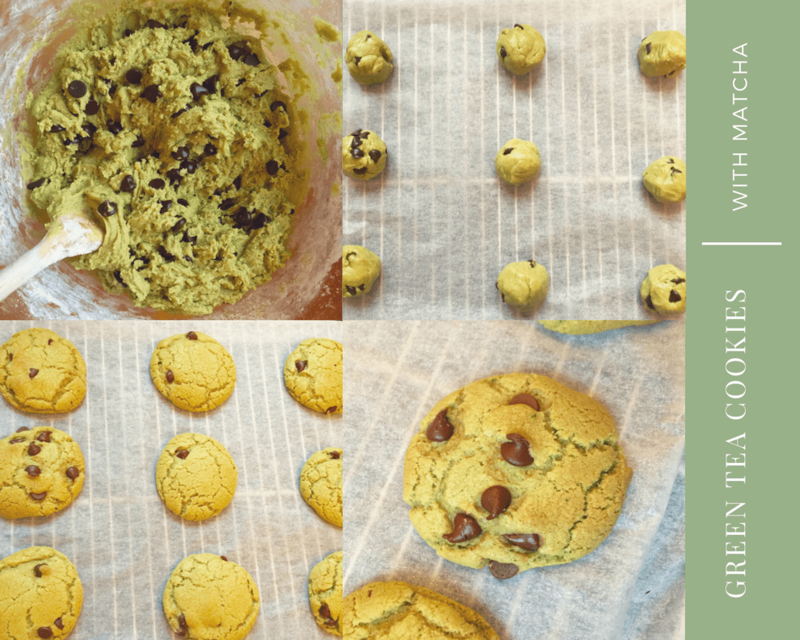 So, last weekend I thought, why not try making cookies with matcha? Sounds like a pretty obvious combination, isn’t it? 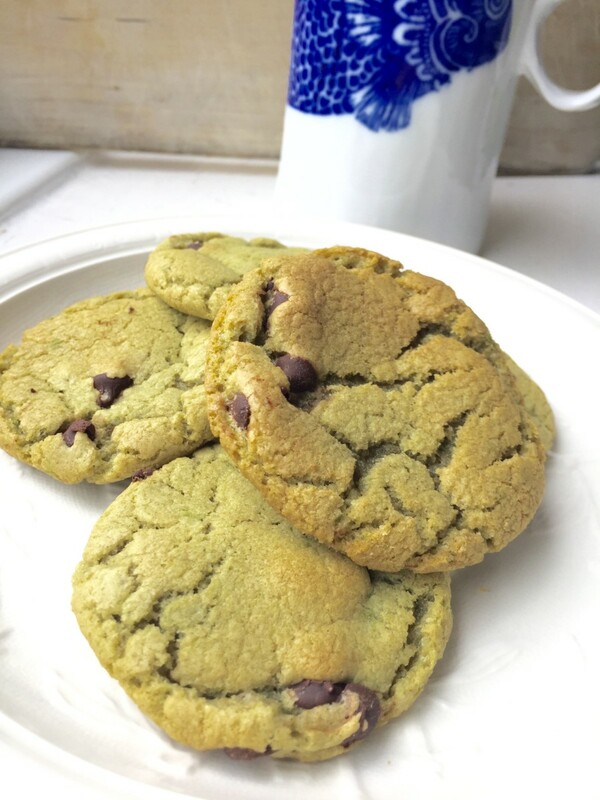 Yummy choc chip cookies with a little twist. I also added a bit of a maca powder to it, but that’s completely optional. And oh so easy, it only takes a half an hour from scratch. Crispy outside and gooey inside – these are delicious. Melt the butter in the microwave (proper bakers feel free to gasp here), so that all the tools you will need is a wooden spoon. In a bowl, cream the melted butter with the sugars and add the mint and vanilla extracts. Add the egg, the matcha, the maca powder, the salt and the baking powder. Combine well. Add the flour. (I never sift the flour either, just stir it in well.) Finally, add the choc chips and combine well. Cover a baking tray with baking paper and evenly place 9 little balls (bit smaller than a golf ball) on it. Bake them for 8 minutes only, I kept checking on them: when they are getting a light golden shade (that’s how they are getting their lovely crispness), they will be just perfect. 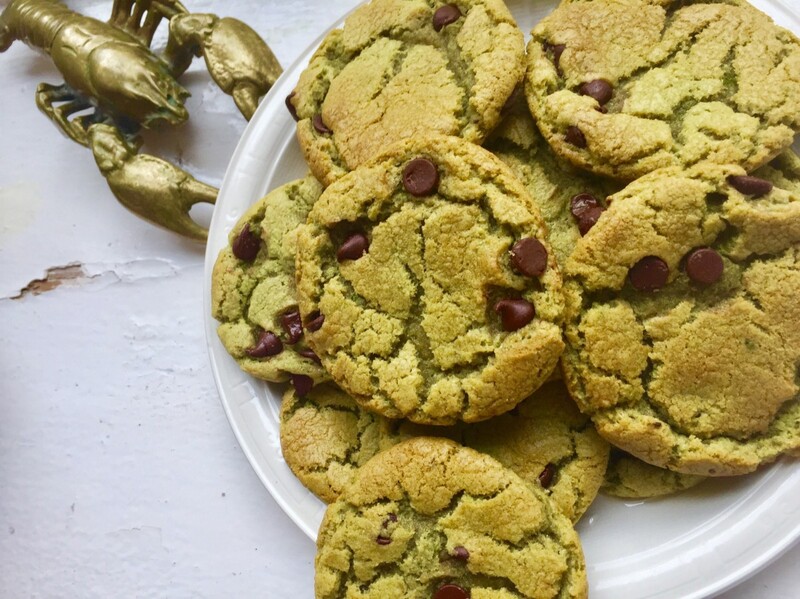 I love matcha too and use it to make energy balls. Will definitely give these a go!